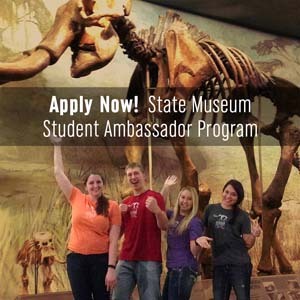 Morrill Hall is accepting applications through April 4 for the 2016-2017 Museum Student Ambassador Program. The University of Nebraska State Museum – Morrill Hall is accepting applications through April 4 for the 2016-2017 Museum Student Ambassador Program. Museum student ambassadors create links between the museum, the university and the greater Lincoln community. Through their participation in outreach events, programs, and museum tours student ambassadors help raise awareness of the museum and the natural sciences. Participants will have the opportunity to learn more about the natural sciences, museums and promotional outreach while sharpening their leadership and communication skills. Students currently enrolled full-time at the University of Nebraska-Lincoln regardless of class level, major or special interest are encouraged to apply. Applicants must meet a 3.00 overall grade point average with an interest in marketing, communications, education, museum work, and the natural sciences. Applications can be found online at museum.unl.edu/volunteer. For more information about the Museum Student Ambassador Program contact Sarah Feit at 402-472-4075 or sfeit2@unl.edu. Established in 1871, the University of Nebraska State Museum is the state's premier museum of natural history. The Museum is focused on promoting discovery in natural science, fostering scientific understanding and interpretation of the Earth’s past, present and future and enhancing stewardship of the natural and cultural heritage of Nebraska through world class exhibits, collections and special events. For more information go to http://www.museum.unl.edu. Apply for 2016 Homecoming Royalty!